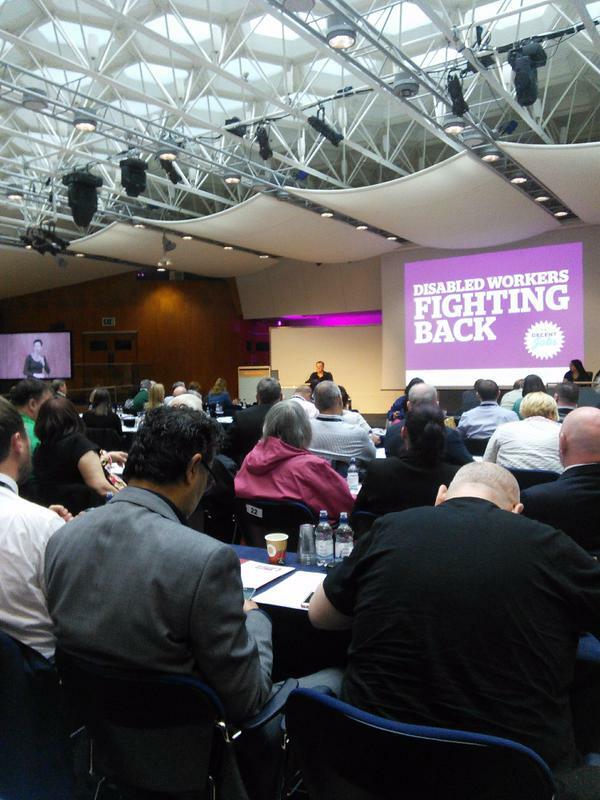 UCU sent a delegation of 9 representatives to the TUC Disabled Workers’ Conference. The UCU delegation leader was Hilary Kurt. There were three late apologies due to sickness and family emergencies which reduced the delegation to nine. TUC General Secretary, Frances O’Grady, gave an opening address which identified post-election issues facing the trade union movement, and particularly the growth in socially divisive rhetoric. UCU expressed concern about reduction to funding for trade union education, and Ms O’Grady expressed the opinion that this training was key to mature, stable industrial relations and the trade union movement would fight to preserve it. Other addresses were given by Sean McGovern, co-Chair of the TUC DWC; Leslie Manesseh, TUC President; Richard Rieser, UK Disability History Month; and Paula Peters (Disabled People Against the Cuts). UCU asked Richard Rieser a question about the focus of disability history and whether it might raise awareness of the positive contributions made by disabled people. A new TUC report was presented: ‘Disabled workers and students in education: the negative impacts of austerity and reform’. This had been prepared with input from the ATL, NASUWT, NUT and UCU. Unfortunately, there was no time to discuss the report, but it is a timely publication which provides a useful summary of current issues. and wider society issues such as the disproportionate effect of welfare benefits reform upon disabled people. UCU submitted a motion about the impact of austerity and marketisation of the post-16 education sector, calling for continued campaigning against the impact of austerity on disabled workers and equality rights. UCU’s motion was seconded by the NUT and supported by Unite the Union. UCU seconded a motion from the NASUWT about indirect discrimination and failure to make reasonable adjustments for workers with mental health or neuro-diverse conditions. UCU spoke in support of a motion from Unite the Union to raise awareness among trade union members and officials about hidden disabilities. UCU also spoke in support of a motion from the Public and Commercial Services Union about Universal Credit. All motions were passed unanimously or with a substantial majority. The motion recommended to the TUC Congress was an Emergency Motion about disabled workers and the new Government. This motion covered a range of topics and was a fair summary of themes discussed throughout the conference. There were elections to serve on the TUC Disabled Workers’ Committee. Patricia Roche, from UCU, was re-elected for the year ahead.